* "That's All Right" Label is very clean exhibiting just a hint of ring wear most noticeable next to 2 of the 3 original push marks, and is in Very Good Plus condition. "Blue Moon Of Kentucky" Label is free of any detracting marks and is in Excellent condition. "That's All Right" Vinyl exhibits numerous light scratches that cannot be felt and do not affect play. This side grades out in Very Good Condition. Please see detailed photos. Some original luster is remaining. "Blue Moon Of Kentucky" Vinyl exhibits numerous light scratches, which are photographed 360 degrees showing all imperfections the lens was able to pick up as this side is slightly worse than the other and grades Very Good Minus. Both sides of this record play through without any skips. Some surface noise is evident in softer passages as was is the case with all Elvis Sun records as these early (1954) Sun pressings were known to have been pressed with a 78 RPM gauge needle. * Being offered is the rare true first pressing misprint of Elvis Presley's first ever single... SUN 209. The "209" on this copy was printed upside down on "The Blue Moon Of Kentucky" side. * This record was pressed by Memphis Plastic Products. It is unknown how many copies of this authentic 1st pressing misprint exist as it was almost immediately discovered by Sam Phillips and company... 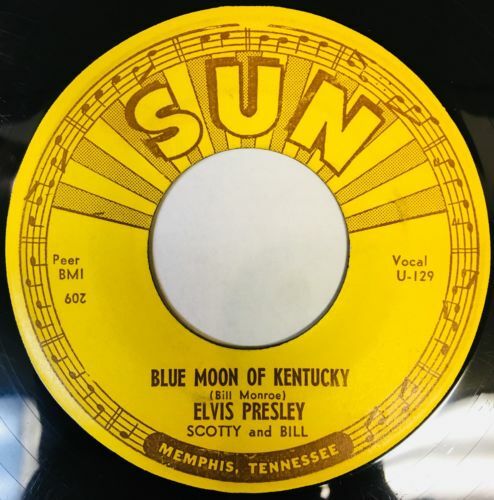 It is many times more rare than the corrected 1st pressings with the 209 right side up on the left hand side of the "Blue Moon Of Kentucky" side, and those copies are nearly impossible to come by... This copy is believed to be one of a handful left in existence, and may possibly be the finest known example remaining. * This is the single most sought after circulation copy of any Elvis Presley record ever released. Only acetates number fewer than this, and were never meant for the public. Great day and thank you for your interest in another MrChandlerHarris listing! I have a 100% EBAY feedback rating, and I intend to keep it that way... Your satisfaction is my motivation. I have a lot of time invested in my listings, and take great care in shipping any item to its new owner. As with all of my listings, my aim is transparency. Please ask any and all questions prior to bidding/ purchasing. I am here to answer them! Cheers. Still Sealed [SS]: New / Unopened. Perfect in every way. I don't use this grade. A nearly perfect record. The record shows no obvious signs of wear. A 45 rpm sleeve has no more than the most minor defects, such as almost invisible ring wear or other signs of slight handling. An LP jacket has no creases, folds, seam splits or any other noticeably similar defects. The same is true of any other inserts, such as posters, lyric sleeves, and the like. Basically, Near Mint looks as if you just got it home from a new record store and removed the shrink wrap. Shows some signs that it was played and otherwise handled by a previous owner who took good care of it. Record surfaces may show some slight signs of wear and may have slight scuffs or very light scratches that don't affect one's listening experience. Slight warps that do not affect the sound are OK. The label may have some ring wear or discoloration, but is should be barely noticeable. The center hole is not misshapen by repeated play. Picture sleeves and LP inner sleeves will have some slight wear, lightly turn-up corners, or a slight seam-split. An LP jacket my have slight signs of wear also and may be marred by a cut-out hole, indentation or corner indicating it was taken out of print and sold at a discount. Many of the defects found in a VG+ record are more pronounced in a VG disc. Surface noise is evident upon playing, especially in soft passages and during the song's intro and fade, but will not overpower the music otherwise. Groove wear will start to be noticeable, as will light scratches deep enough to feel with a fingernail) that will affect the sound. Good does not mean dead, but does mean getting rough! A record in Good or Good Plus condition can be put onto a turntable and will play through without skipping. But it will have significant surface noise and scratches and visible groove wear. A jacket or sleeve has seam splits, especially at the bottom or on the spine. Tape, writing, ring wear or other defects will start to overwhelm the object. The record is cracked, badly warped, and won't play through without skipping or repeating. The picture sleeve is water damaged, split on all three seams and heavily marred by wear and/or writing. The LP jacket barely keeps the LP inside it. Inner sleeves are fully seam split, and written upon.